Since July 2013, the Curiosity rover has travelled just over 23,300ft (7,100 metres) on the surface of Mars at an average of about 1,310ft (400 metres) per month. 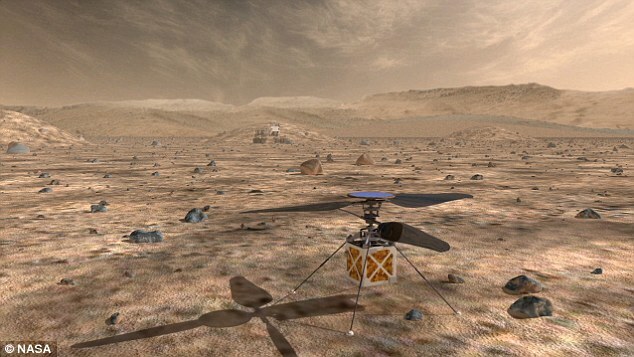 But if a new Nasa project comes to fruition, future rovers could carry a small helicopter with them that could cover half a kilometre in just a single day. The vehicle would perform daily flights to scout the surrounding area on Mars much faster than possible for ground based rovers. 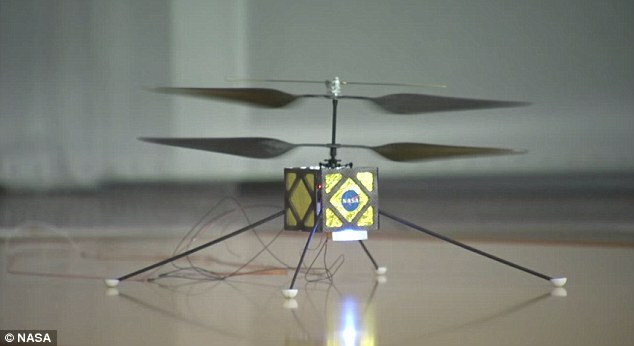 The concept is currently being tested by scientists at Nasa’s Jet Propulsion Laboratory (JPL) in California. It is designed to provide an alternative to the slow, methodical progress required by rovers in order to avoid obstacles and plot a safe route across the red planet. Nasa's unnamed next generation rover, predicted to launch in 2020, will carry on exploring the Red Planet, with upgraded hardware and instruments to examine Mars' rocks - and it will possibly even take this Mars helicopter design with it. The rover will assess the potential of the environment for humans to live in one day and search for signs of Martian life. It will identify and collect a collection of rock and soil samples, which it will be able to send back to Earth intact, unlike the powdered samples collected by the current rover. Dr Charles Elachi, director of Nasa's Jet Propulsion Laboratory, has previously said that collecting a rock sample and bringing it back to Earth is Nasa's top priority. Scientists are particularly interested in the samples so they can understand the hazards posed by Martian dust and demonstrate how oxygen can be created - details important to consider for human missions to Mars and the future colonisation of the planet. The rover marks the next major step in fulfilling President Obama's challenge of sending humans to Mars in the 2030s. The vehicle envisioned would be composed of a small cube with rotor blades on the top. It would weigh 2.2lbs (1kg) and measure 3.6ft (1.1 metres) across from the tip of one blade to the other. While the design is still very much in a concept stage, the vehicle would likely have a camera to ‘scout out’ areas ahead and help a rover on the surface move faster. On the top of the helicopter would be a solar panel to power it during the day, and keep it operational during the night. Each time it took flight on a daily basis, it would fly for about two to three minutes before landing on the ground again. ‘If our rover was equipped with its very own helicopter that could see over the tall object in front of us, it would allow us to make decisions much more efficiently, on which we’d command the rover,’ explained Mike Meecham, Mechanical Engineer at JPL, in a video detailing the concept. Although Mars has just three eighths of Earth’s gravity, he explained that it isn’t necessarily easier to fly on Mars - because the atmosphere is so thin. Once you lose Earth’s dense atmosphere, the rotor blades would need to spin faster or be bigger, or the helicopter lighter than one on Earth, in order to fly. ‘There is the challenge of the very low density of the atmosphere, and there’s the challenge of keeping the whole mass of the system small so that we don’t overwhelm the lift capability of this system,’ said Dr Bob Balaram, a roboticist at JPL involved in the design of the helicopter. Nasa has already built a full scale mock up of one of the helicopters they might consider flying on Mars, which they have been testing in a vacuum chamber on Earth. They have found that the rotors need to spin at about 2,400 rotations per minute to provide enough lift for two to three minute flights of about half a kilometre. But it is the landings that will be the riskiest part of the mission every day. 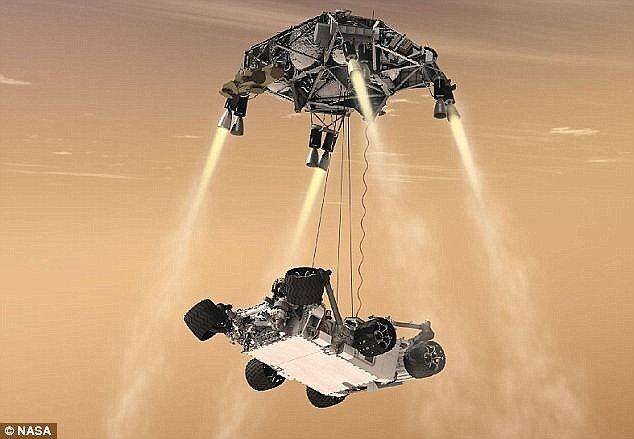 Curiosity infamously had ‘seven minutes of terror’ in the time between entering the Martian atmosphere and landing on the, but Dr Balaram said the helicopter would have its own ‘seven seconds of terror’ every day. When the concept would be completed however, or whether it could be part of Nasa’s 2020 Mars rover mission, is not yet known. But the design does at least provide an intriguing proposal for future missions to the red planet.